'The Annals of Ulster at 825 record the year of plague and famine when the Vikings fell on the churches of Downpatrick and Moville with fire and sword. A great pestilence in the island of Ireland ... a great famine and failure of bread. The plundering of Dun-lethglaise by heathens. The burning of Magh-Bile with its oratories by heathens, in which a great many were slain. While a 'great many' monks were slain at Moville, it is another, and more impressively attested, bloodletting which singles out 825 as a year indelibly marked by the red martyrdom. This most infamous of viking atrocities against the Gael is entered with characteristic brevity by the Annals of Ulster at 825. Martyrdom of Blathmacc, son of Flann, by heathens in I-Columcille. The same event is shrewdly placed in a modern perspective by the historian Barbara Crawford as the point where 'the Viking traders of recent history books and television series turn into the Viking raiders of yesteryear'. Blathmac mac-Flainn was, like Columcille himself, of royal blood and born a prince of a branch of the Ui-Neill. He had been a warrior who had entered the religious life as the abbot of some unidentified monastic community, most probably one enjoying the patronage of his own dynasty in Ireland. Resolving with solemn deliberation to suffer 'the scars of Christ', he came from Ireland to join whatever monastic community remained on Iona to assume some form of abbatial authority over the shrine at greatest hazard from the sea-raiders. In so doing he confirms the strange new sanctity which surrounded I-Columcille in the decades following Cellach's transfer of the chief church of the Columban dominion to Kells. The most holy island of the western sea had passed into the viking age as the Golgotha of the Gael. When the bones of other saints were translated into the reliquaries of gold and silver in the eight century, it has been assumed that the remains of Columcille were similarly enshrined. The annals contain a sequence of entries for the early ninth century noting the voyages of Cellach's successors, the abbots Diarmait and Indrechtach, carrying the 'reliquaries' of Columcille between Kells and Iona. These have been taken to represent the physical remains of the saint regularly ferried between the two churches, but some closer examination of the Irish text of the annals suggests that this might not have been exactly the case. The annalists use two different Irish words in this context, both of which translate as 'relics' but each with its own precise meaning. The word martra is used to represent the corporeal remains of a saint, while mionna generally identifies what might be called relics of association. A crozier or a habit worn by the saint, even lesser physical remains such as a fingernail or small bone separated from the body, were mionna,which is the word used by the annals for the relics of Columcille shipped back and forth between Erin and Alba. If those venerated remains encased in gold and silver were not in fact his physical remains, then what remained of the earthly form of the saint would have stayed on Iona. Whether as a temporary or a permanent arrangement, there is indisputable evidence that the enshrined remains of Columcille were on the island when Blathmac suffered his martyrdom defending them from the northmen in 825. Whether by reason of his courage, his piety, or, more probably the grisly nature of his martyrdom, Blathmac's renown spread to the continent with the Irish monks seeking sanctuary overseas in greater numbers as the viking onslaught on Ireland intensified. 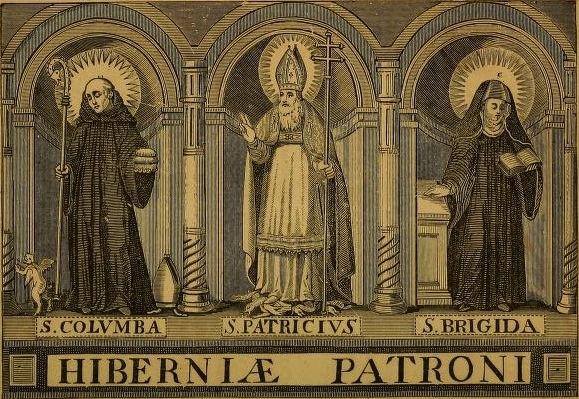 It must have been one of these peregrini, most probably a surviving eyewitness of the event, who provided Walafrid Strabo, abbot of the Irish monastery at Reichenau in Switzerland, with the wealth of detail which informed his remarkable poetic elegy on the martyrdom of Blathmac. Abbot Walafrid's hexameter verses, written within twenty-five years of 825, survive as the most detailed contemporary narrative of a viking raid on the western seaboard. His continental viewpoint prompted him to identify Blathmac's assailants as 'Danes' when they were indubitably of Norse origin, but his account has every other hallmark - not least quotations of speech - of a first hand-testimony. It is also a text of great length and laden with pious homilies framed with scriptural quotation, so I have selected only those passages of especially significant relevance here. A certain island lies on the shores of the Picts, placed in the wave-tossed brine; it is called Eo, where the saint of the Lord, Columba, rests in the flesh. This island he [Blathmac] sought under his vow to suffer the scars of Christ, for here the frequent hoardes of pagan Danes were wont to come armed with malignant furies. Blathmac, forewarned of the approach of sea-raiders, called his monks together to prepare them for the impending martyrdom. Those ready to endure that fate were to stay beside him, but those not yet ready were to take refuge elsewhere in the island. There seem to have been places of safety appointed and accessible by designated pathways for just such an occasion and it is reasonable to assume that some similar arrangement had been used during earlier raids. The community, moved by these words, determined to act according to their strength. Some, with a brave heart resolved to face the hand of sacrilege, and rejoiced to have to submit their heads to the raging sword; but others, whose confidence of mind had not yet risen to this, took flight by a path to known places of refuge. The golden dawn dispelled the dewy darkness and the glittering sun shone again with glorious orb, when the pious cleric stood before the holy altar, celebrating the holy offices of the mass, himself a victim acceptable to God to be offered up to the thundering sword. The rest of the brethern lay commending their souls with prayers and tears, when behold, the cursed bands rushed raging through the unprotected houses, threatening death to those blessed men and, furious with rage, the rest of the brethern being slain, came to the holy father, demanding he give up the precious metals which enclosed the sacred bones of Saint Columba. But [the monks] had taken the shrine from its place and deposited it in the earth in a hallowed tumulus, or grave, and covered it with sods. 'I know not of the gold you seek, where it may be placed in the ground, and in what recesses it may be hidden; but if it were permitted by Christ for me to know, never would these lips tell it to your ears. Savagely bring your swords, seize their hilts and kill. O God, I commend my humble self to Thy protection'. Hereupon the pious victim was cut in pieces with severed limbs, and what the fierce warrior could not compensate with a price, he began to seek out by wounds in the stiffened entrails. Nor is it a wonder, for there always were and always will arise those whom evil rage will excite against the servants of the Lord. Thus the abbot Walafrid portrays the martyrdom of a 'servant of the Lord' in an account which indicates some greater significance than the summary despatch of a martyr to his crown. If such was the fate dealt out to Blathmac mac-Flainn, then the renown accorded his martyrdom might be explained in terms of its fearsome symbolism no less than its savage circumstances. It can only have represented the symbolic sacrifice of the White Christ before the shrine of Columcille to Odin battle-bringer. No image from the pages of the insular gospel books is possessed of such ominous aspect as the folio from the Book of Kells portraying Christ at Gethsemane in the form of a Celtic holy man seized by two gnomic warriors. It would have appeared to the sixth age of the world as the foretelling on vellum of the red martyrdom of Blathmac on I-Columcille. John Marsden, The Fury of the Northmen - saints, shrines and sea raiders in the viking age AD 793-878, (London, 1996), 87-91. He appears to have had a double festival: one on this day, and another on the 24th of July. This saint is venerated abroad on the 19th of January. In the Martyrologies of Donegal and Tallagh his feast is set down on the 24th of July. This latter, perhaps, was some translation of his relics. We are told that in the Irish language this saint is called Blathmhac. The first syllable of this compound name has an equivocal signification. Blath, when pronounced long, has the literal meaning," a flower," and the metaphorical signification, "beautiful ;" when pronounced short, it is rendered into the English words,"honour" or "fame." The word Mhac is Anglicized "son." Truly was this heroic man named.